Dr. B. R. Shetty is the Founder and Chairman of NMC Healthcare, Finablr, Neopharma and BRS Ventures. Dr. Shetty is a serial entrepreneur, pillar of the community and social servant. A visionary leader, who follows his heart and intuition, he has explored untapped markets and paved new paths in his successful entrepreneurial journey in UAE. He started his innings in 1975 with the launch of New Medical Centre (NMC), the first private healthcare facility in UAE. His distinctive capabilities and foresight have transformed the healthcare industry in the region. His commitment to provide state-of-the-art facilities enabled NMC to be listed on the London Stock Exchange and included as a part of the coveted FTSE100 index. NMC has also been inducted into the exquisite club of MSCI Global Index. The burgeoning expatriate population in UAE triggered the need for a formal and safe money transfer channel. Dr. Shetty sensed an opportunity in that challenge and ventured into the remittance sector by launching UAE Exchange; which is now a leading global remittance, foreign exchange and payment solutions brand. He identified an opportunity in currency exchange business and acquired Travelex, the world’s leading foreign exchange specialist. With this acquisition, he was successful in bringing two category leaders under a single umbrella. All these leading brands are now a part of the holding company – Finablr. In a step towards backward integration into the healthcare sector, Dr. Shetty set-up Neopharma in 2003. Neopharma is a state-of-the-art manufacturing facility and has collaborations with multinational companies like Pfizer, Merck, Abbot Laboratories, Hetero Pharmaceuticals and Biocon to name a few. Recently, Neopharma has acquired an antibiotic manufacturing facility in the USA. Diversified business interests of Dr. Shetty led him to open quality institutions in the education, hospitality, and environment sectors. He has also recently acquired the Assam Tea Company in India. As a part of the strategy to provide innovative solutions across varying verticals, Dr. Shetty has recently established BRS Ventures. The company has already earned itself the reputation as one of the leading and premium business houses in the United Arab Emirates. The company has also established a global presence with successful acquisitions and strong partnerships. With a belief of giving back to the country, Dr. Shetty has established a leading healthcare services brand – BR Life. Headquartered in Bengaluru, Dr. Shetty currently operates multi-specialty healthcare facilities in India, Nepal, Africa and Middle East. 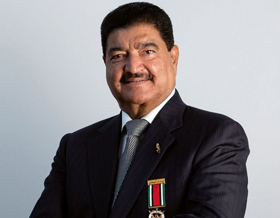 Dr. B. R. Shetty’s business accomplishments and exceptional social work have earned him the “Order of Abu Dhabi”, the highest civilian honour bestowed by the Government of Abu Dhabi. He is a recipient of the prestigious Padma Shri award, one of the highest civilian honors from the Government of India. The former President of India, late Dr. APJ Abdul Kalam conferred upon him the Pravasi Bharatiya Samman Award, for his outstanding contribution towards betterment of NRI community.